Sarah Paramor uses traditional basketry skills to create contemporary basketry, often unconventional bags. Sarah has a taste for the unusual and for the catwalk. She has plaited the local Highland hairmoss to resemble tweed on one side and AstroTurf on the other, though she is just as likely to work with corsetry boning and elastic. 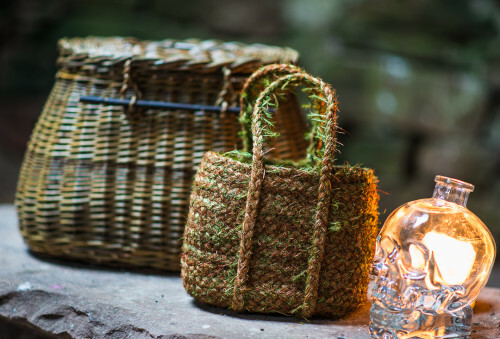 Sarah’s “Dark Tendril Bag” won second prize in the Worshipful Company of Basketmakers’ Basketry of the Year 2018 competition, and her “Highland Hairmoss Basket” came third in the same competition in 2017. 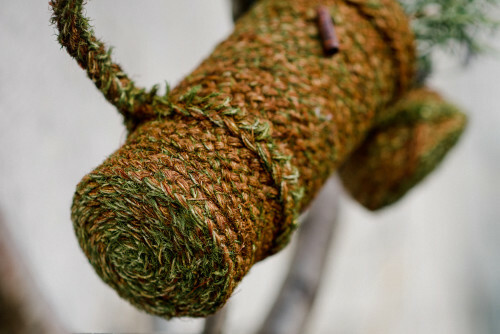 In 2018 Sarah was awarded a Visual Artist and Craft Makers Awards grant; “A Bag for Isobel”, made of plaited and stitched hairmoss, is in the Isobel Wylie Hutchison Collection in Carlowrie Castle, and she has had pieces in the Knitting and Stitching show at Olympia, and in the Scottish Basketmakers Circle’s “Woven Together” show. In 2016 “Variations on a Flamingo”, tiny coiled baskets made of various materials, were selected for the “Inspired By” exhibition of work inspired by pieces in the V&A. Sarah trained on the two-year City Lit Basketry course, and continues to learn skills from traditional basketmakers. She lives in Applecross on the west coast of Scotland, and makes baskets in a restored byre. Basketry of the Year 2018, Worshipful Company of Basketmakers: “Dark Tendril Bag”, bias-plaited corsetry-boning, awarded second prize; £1,000 prize. Highland Visual Artist & Craft Maker Award Scheme 2018: awarded a grant to explore traditional basketry techniques for use with Highlands plants. Basketry of the Year 2017, Worshipful Company of Basketmakers: “Highland Hairmoss Basket”, plaited hairmoss bag, awarded third prize; £500 prize. Isobel Wylie Hutchison Collection, October 2018, Carlowrie Castle: “A Bag for Isobel”, plaited hairmoss bag inspired by a botanist’s vasculum; Craft Design House collaboration. Woven Together: Scottish Basketmakers’ Circle Exhibition 2018: “Crow’s Feather Bag”, bias-plaited corsetry-boning bag; show celebrating SBC’s 30 years. Knitting and Stitching Spring 2018, Olympia: “Variations on a Flamingo”, small coiled vessels, and “Crow’s Feather Bag” included on CityLit “Making” stand. Basketmakers’ Dozen, Craft Central, London, 2017; twelve contemporary basketmakers; final work from City Lit Basketry. Inspired By..., Morley Gallery, London, 2016: “Variations on a Flamingo” chosen for this exhibition of work inspired by the V&A’s collection. And They Loved Hats, Cartwheel Hat, 2018: assisted milliner Edie Obilaso in reinterpretation of 1940s bias-plaited straw hat. Noel Stewart, S/S 2017, London Fashion Show, 2016: made rush-and-willow basketry for couture hat; front cover, Vogue China. 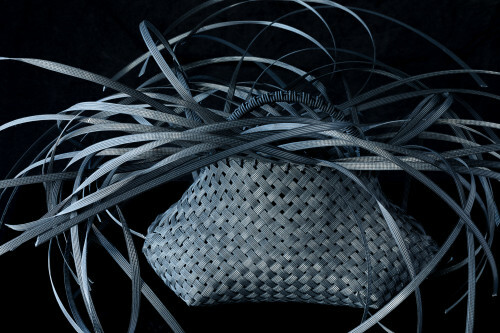 Noel Stewart, A/W 2016, London Fashion Show, 2016: made cane basketry element for a chromed couture hat; full page, Horseriders’ Journal; featured on hoodlondon.com. 2017/18 Lise Bech, asymmetric willow baskets; Caroline Dear, coiling; Simone Simons, esparto grass bags; Felicity Irons, rush. 2015-17 City Lit Basketry two-year course; all aspects of basketry.